After reading my book in bed and listening to B’s music on her iPod station, relaxing, musing, I thought some more about my trip yesterday. However, to my astonishment, we arrived at a strange angle, and so instead of circling wide towards the sea just before we could see the landing strip, it was as if we were heading straight for the north of Africa, passing the south coast of France on our way to, dare I say, more beautiful, certainly more exotic, landscapes. For a long time, all we could see was the blue of the sea (along with some jellyfish, if you had the imagination of the brats at the back of the plane) and the white of the boats bobbing seemingly gently below us. Then suddenly, mountain peaks appeared, white as coconut ice cream, their edges rugged, grey, raw. I had never seen the Alps while hovering above the sea. The best of both worlds right here, one below me, one ahead of me, nearly reconcilable. I was mesmerised. 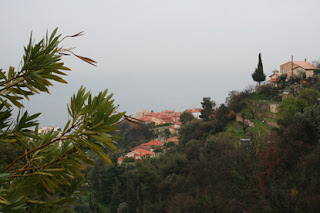 Apparently, we went as far as Menton and Monaco, then we started flying lower and back towards where we should have headed in the first place – Nice airport – going along the coast. We passed Cap Ferrat – so distinctly a cape when you’re flying above it! – the port of Villefranche, the Promenade des Anglais, and finally the strip of land where the plane could be put down, after a two-hour journey. Within minutes, we were at our gate, disembarked, and five minutes later my suitcase was rightfully mine again. B’s partner, R, arrived as I was busy looking at Stelios and the man next to him, both being welcomed by a handsome French man, and all was well in the world. I had made it safely to the land of my childhood holidays. My present holiday could start! I stumbled across Rivera Radio when I was living out in Aix en Provence too. I have to say that I was disappointed because it spoilt the whole "immersing myself in France and Frenchness" experience. They do play some very good music, though, I have to say! And there are not too many ads (French ads drive me crazy! ).